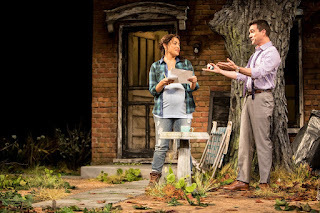 Native Gardens tells a deceptively simple story of mismatched neighbors that touches on topics from immigration and white privilege to local ecosystems and colonization. And it's funny! 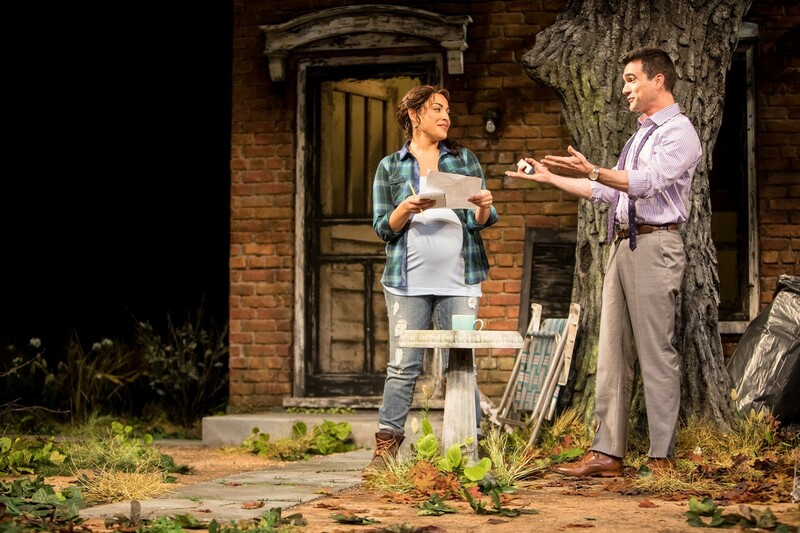 Karen Zacarías's play is so new that the ink is still dry. After premiering in Cincinnati, the author and director (Blake Robison) came to the Guthrie to work on a script that will be the version that other theaters can license. And they should, because it's a winner. In a posh neighborhood of Washington D.C., two houses stand right next to each other. One is meticulously kept, with an elaborate garden. The other looks worse for wear, with a dry and barren backyard. We meet the new residents of the fixer-upper: the very pregnant Ph.D. student Tania Del Valle (Jacqueline Correa) and her lawyer husband Pablo Del Valle (Dan Domingues). Both are excited by their new house--Tania to create a beautiful garden of native plantings and Pablo to have a home base from which he can work towards partner in his office. Jacqueline Correa, Dan Domingues, Sally Wingert and Steve Hendrickson. Photo by the incomparable Dan Norman. Fantastic set by Joseph Tilford. They are excited to meet their next door neighbors, the Butleys. Virginia (Sally Wingert), a retired defense contractor, and Frank (Steve Hendrickson), who works for "the Agency." Frank's great goal in life is to win the local gardening competition and obsessively cares for his pristine English garden. When Pablo and Tania plan a new fence to divide the yards, taking down the existing eyesore, they find that their property extends a few feet farther than they thought--directly through Frank's flower beds. Conflict ensues. Jacqueline Correa, Dan Domingues. Photo by Dan Norman. 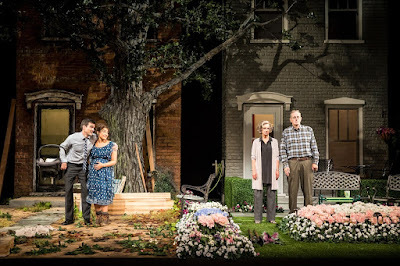 Contemporary dramas and comedies that involve neighbors and conflict are nothing new (see Detroit, God of Carnage), but the delight in Native Gardens is that it's not just hateful white people shouting at one another. For a play that runs a tight ninety minutes with no intermission, Native Gardens covers a lot of ground (hee hee). It's a play about identity and privilege, of Americanism (or North Americanism), land, and culture. But it does all this while still being dang funny. Playwright Karen Zacarías, co-founder of the Latinx Theater Commons, has also written musicals (in addition to her plays) and you can hear the music in her writing. Her dialogue feels natural, but musically rhythmic and a treat to listen to, particularly when performed by such a great cast. Dan Dominguez and Jacqueline Correa create an endearing and charming (but certainly not perfect) couple, and Dominguez has fantastic comic timing. You can't ever go wrong with Sally Wingert as an uptight white lady, and Steve Hendrickson is in turns infuriating and pathetic as Frank. The landscape technicians who toil silently in the background (Reyna Rios, Pedro Juan Fonseca, Brandon J. Cayetano and Guillermo Zermano) provide a fantastic additional layer to the action, and even more realism and humor. Dan Domingues. Photo by Dan Norman. Director Blake Robison, who came with the play from the Cincinnati Playhouse, hits the perfect tone with this play. 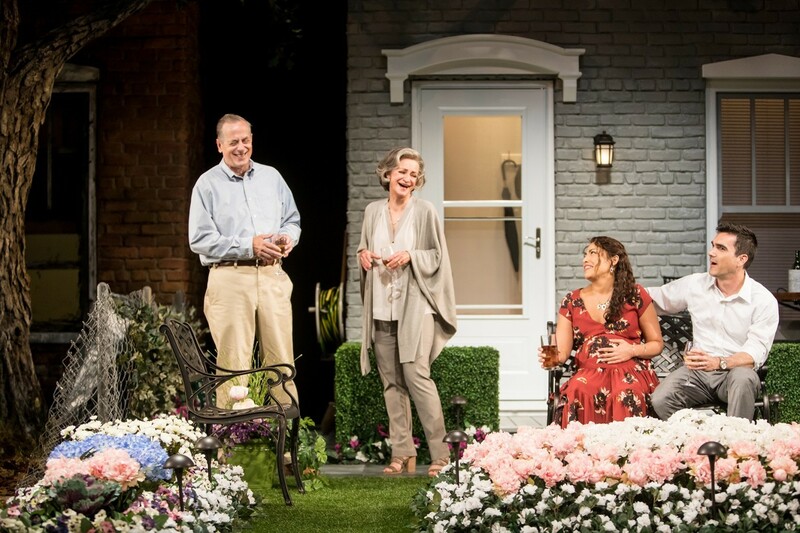 So much of the audience at the Guthrie (particularly on opening night) has far more in common with the Butleys than the Del Valles, and Robison keeps the perfect edge on the humor so that the audience never tips over into identifying too much with the Butleys. 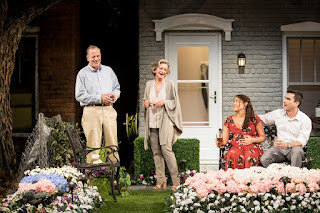 It's a fine, fine line, but Robison and Zacarías do a gorgeous job with it, and I'm so pleased to have this hilarious and thought-provoking show at the Guthrie (through August 20! ).